How do you draw a thousand tulips? What’s the real secret landscape artists know? It's all about simplification. Drawing often means looking at complicated things and figuring out how to draw them in an uncomplicated way. 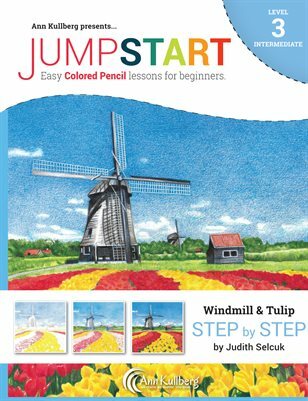 In this tutorial, Judith shows you how to simplify: to see large shapes first, then easily hone-in on a few details. In nine simple, do-able steps — and with just 21 colors — you can learn the art of simplifying, and draw this spring scene that will brighten a corner of your home all year long! • Draw a brilliant sky and clouds in just three layers. • Use simple tricks for fine details. • Create strong light easily. • Simplify complicated details to save time and frustration.